Professionals depend on Super-StikT adhesive for its superior strength, time-tested performance and versatility. Super-StikT is the ideal solution for Segmental Retaining Walls, Pavers and Masonry. You can even apply it when damp! Super-StikT Adhesive, is the preferred choice for industry professionals worldwide, and is recognized for its superior strength, time tested performance, and versatility. Super-StikT Adhesive is so versatile, it practically bonds anything, whether wet, frozen or treated....and most large panel-type substrates! 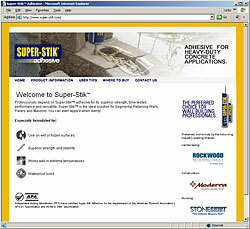 Super-StikT Adhesive was the first adhesive ever to pass the American Plywood Association's AFG-01 Specification. Also passes ASTM C557, ASTM D3498 and is certified for use with FHA/HUD Use of Materials bulletin #60.